Voting opens today for the Ryerson Students’ Union elections. 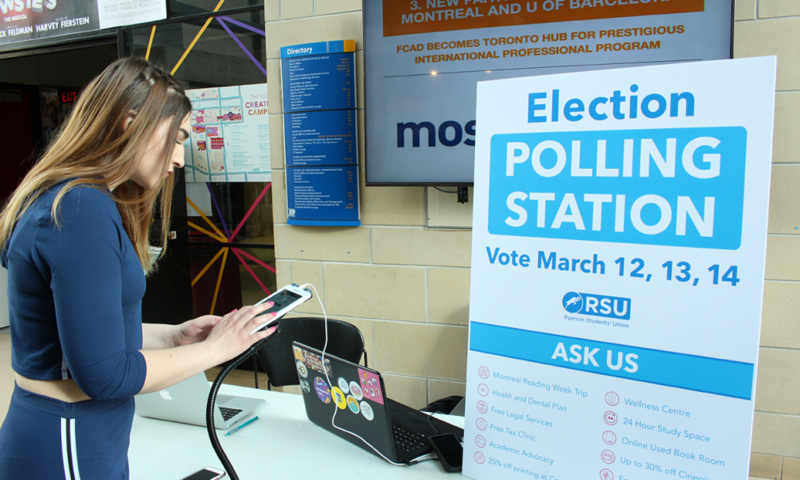 Students are able to cast their ballots in-person at one of the six polling stations on campus or online at my.ryerson.ca. Stations on campus will be open from 10 a.m. to 5 p.m. on Tuesday and Wednesday, and from 10 a.m. until 4 p.m. on Thursday. Online voting will also close at 4 p.m. on Thursday. Ryerson students enrolled in a full-time undergraduate program or full-time or part-time graduate program will be eligible to vote for executive committee and board of directors’ positions. There are currently 86 students running for six executive committee and 34 faculty, graduate and international student representative positions. Four slates are represented this year, including Candor, Inspire, Refresh and Rhino Party. Alex Dinh is the first independent candidate to run for president of the RSU since 2016. For a full list of candidates and positions, click here.